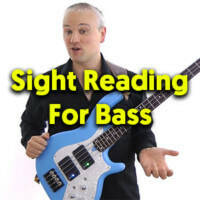 This lesson gives an introduction to the basics of reading music on bass guitar. Many players find difficulties in getting started with reading music because they try reading lines at the level of their overall playing. The key is to start reading music with the absolute basics. Reading pitch and rhythm in isolation and reading 2 or 3 notes on a single string in one position. This helps with getting a foothold and it’s much easier to build on that foundation. Thanks, this is great! You are really a great teacher! Great lesson! thank you Mark!